Transformed our English altars and our ways. 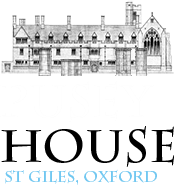 I learned at Pusey House the Catholic faith. If you come to Pusey House – to pray, to participate in the glorious Sunday liturgy, to study, to share in the common life of table and hospitality – then the priests of the House will set before you the fullness of the Catholic faith: the faith which, we believe, is the faith of the Church of England too. We will try to help God’s work of making and re-making you, in the image of His Son, Jesus Christ, who took flesh for our sake. And in so doing, we will hope to enjoy your company, and to be enriched by it: as we hope you will enjoy ours. You can be assured of a place in a community where there is plenty of laughter along the way.